This sunday we went out for a walk and some fresh air after recent events I mentioned a couple of posts before. We climbed the mountain of Montjuic to visit the Olympic Ring one more time. 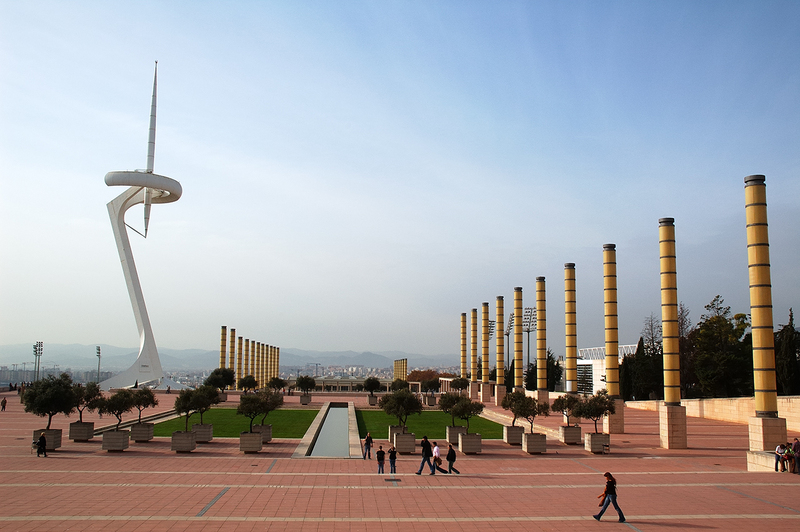 I took some new pictures of the big squares and particularly the Calatrava Telecommunications Tower you can appreciate on the left and featured some months ago here. Bella simetría, con un tinte futurista y un cielo de siempre, bello. it's so not from this world. I imagine Star Wars-like creatures milling about. oo..the whole photo looks amazing. mmm...the sky and the red ground, and that unique shape sculpture!! Gracias Irredento por el sagaz comentario. Yes that reminds me of something I said in an old post about some scene in Starwars. You are reading my mind in this one. Thanks Edwin. Thanks Jing for all the simultaneous comments. I see you appreciate the beauty of the place. merci Carlos de continuer, vaille que vaille, à nous enchanter! que la beauté de votre ville vous apporte, à vous et à votre épouse, la sérénité dont vous avez besoin en ce moment. Your photos inspire me at the end of a long American work day, which will soon become a long working night. Thank you for this window into one of my favorite cities in the world. i like the works of Santiago Calatrava,Great architect! que preciosidad de foto :D!